This morning, July 1st 2016, a dozen of us gathered in the porch of St Andrew’s Church at West Deeping. At 7.30 a.m., Brian Marsden, a staunch supporter of the Royal British Legion, Langtoft, Deepings and Districts Branch, blew 3 short blasts on his ARP whistle. This was the signal for ‘zero hour’ for the British troops lined up along the trenches in Picardie in Northern France, exactly 100 years ago. We remembered all those 19,240 killed and 35,493 wounded on July 1st 1916, the first day of the Battle of the Somme but West Deeping particularly remembered one of its own soldiers who fought and died on the first day on the Somme, July 1st 1916. 2nd Lieut. Joseph Anstee was the younger son of William Anstee, the miller at West Deeping Mill, just next to the church. He had grown up in the village and judging by frequent mentions in the local newspapers seems to have been talented as a singer and pianist. He was often complimented for his flower decorations in the church and was involved with activities at the village Reading Room. He was in his early 20s when he signed up for a short military training with the Inns of Court Officer Training Corps in Berkhamsted and in October 1915 he was commissioned to the 2nd Lincolnshire Regiment. It is possible he went to France soon afterwards as the Army had an urgent need for troops after their losses at the Battle of Loos. The 2nd Battalion of the Lincolnshire Regiment was part of the 8th Division when the British Army attacked the German front near Albert, in Picardie, Northern France. Together with the 2nd Royal Berkshires, they were at the centre of the line, leading the attack on the village of Ovillers-la-Boisselle. Joe, a 26 year-old subaltern, would have been the one responsible for getting his men out of their trench and forming them up to set off across ‘no man’s land’ towards the German front line, 800 yards away. Charging into the full weight of an artillery barrage, the attack halted before it even got half way. It’s most likely that 2nd Lieutenant Anstee died in the first hour of the first day of the battle that was to last another 140 days. One of 72,194 men who have no known grave, he is commemorated at Thiepval (Face C of Pier 1). If you go almost to the end of the King Street Cemetery in West Deeping, you will find an Anstee family memorial not far from the right hand fence. Joseph’s parents are buried here but the inscription on the gravestone also commemorates ‘Lt J Anstee Killed in action in France July 1st 1916 Aged 26′. A Remembrance Cross was placed by the grave this morning. If there are any Anstee descendants reading this, we would be most interested to hear from them. This entry was posted in Family History, West Deeping History, World War 1 on July 1, 2016 by wdheritage. West Deeping Heritage Group’s last meeting of the season is on Tuesday April 19th at the Village Hall, King Street, West Deeping. With refreshments from 7 p.m., the Annual General Meeting will start at 7.30 p.m. The aim is to deal with the Agenda as quickly as possible! Then we can spend time looking at some of the village archives. Take your pick from the collection including old photographs, newspaper cuttings, West Deeping Burial Board registers and the minutes of the first Parish Meeting. Another example is the Ledger of William Ackland who was Parish Clerk from 1919 to 1969 as well as the village wheelwright, carpenter and undertaker. Some people might consider it rather lugubrious or even inappropriate to read the details of funeral arrangements but others will be fascinated – this is village history! The burials recorded for 1944 appear on page 63 – a boy of 11 who had fallen from a train, and Susanna Smart, who lived in The Row and died at the ripe old age of 89. We have her photograph too. This entry was posted in Family History, Our Events, West Deeping History on April 18, 2016 by wdheritage. West Deeping Heritage Group will be meeting on Tuesday 19th April 2016 for the Annual General Meeting, at 7.30 p.m. in West Deeping Village Hall. The Agenda includes the usual round-up of the year’s activities and finances as well as a special item – to propose a couple of amendments to the original Constitution. We will try our best to deal with the business as briefly as possible! Aerial photo of the corner of The Lane and King Street taken in the early 1970s? If anyone has a particular interest or a query that might be answered from the collection, please contact Maggie Ashcroft before the meeting. Bring your own village or family archives if you have them! This entry was posted in Administration, Archives, Our Events, West Deeping History and tagged West Deeping on March 30, 2016 by wdheritage. The chancel ceiling of St Andrew’s Church in West Deeping provides a wonderful image for a Christmas card! This entry was posted in West Deeping History and tagged St Andrew's Church, West Deeping on December 24, 2015 by wdheritage. September 15th 1969 – 46 years ago – one of the 16 pupils at West Deeping Church of England School filled in the weather chart – it was the first entry for the Autumn term, which had started on September 9th. The day was cold with showers (not unlike today!) and the wind was from the north-west. How do we know? When the school closed in 1971, a former pupil at the school, Nick Sandall, retrieved 3 large wall charts on which the wind and weather had been recorded. Earlier this year, the charts came to light when the family was clearing the garage at 41 King Street before the house was put on the market. They are now in the safekeeping of West Deeping Heritage Group. There are not many ‘memorabilia’ from the school left – or are there? If you were a pupil at West Deeping and have anything at all that brings back memories, maybe just a photograph – do contact us! This entry was posted in Archives, Education, West Deeping History and tagged West Deeping School on September 15, 2015 by wdheritage. If you haven’t already visited the exhibition The Deepings Remember 1914 to 1918 – today is the last day! The Deepings Community Centre in Douglas Road, Market Deeping will be open from 10 a.m. to 5 p.m. today, Sunday 9th November. One of the visitors to a preview on Friday was 89 year-old Bernard Roffe, former resident of West Deeping and nephew of Richard Roffe, who died in 1917 at the Battle of the Dunes at Nieuport in Belgium. The Deepings Roll of Honour poster gallery features 50 men (and some women) who served in WW1 – not only those who died, but many who came back and are familiar names in the area. 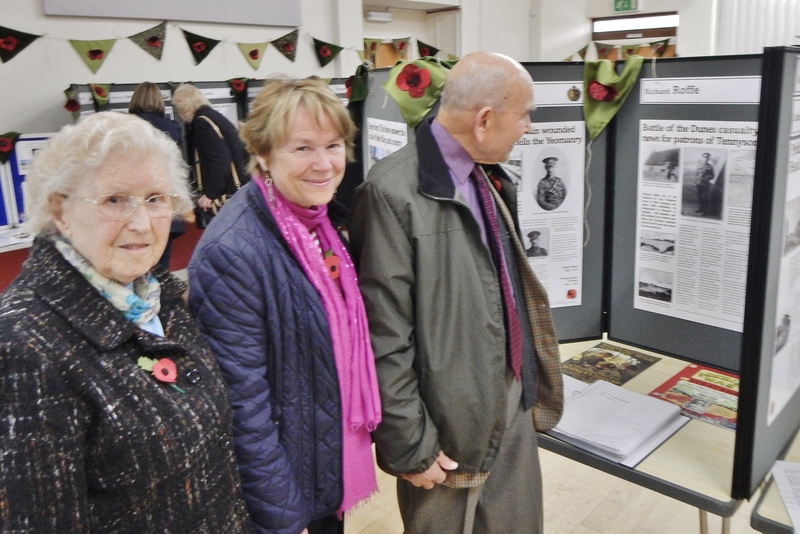 Many of their 21st century descendants have already visited the exhibition, so too have people who have come more recently to the Deepings and are interested in finding out how to go about researching their own families in the First World War era and to learn about the heritage of our communities. Other areas of the exhibition include The Home Front, recreating a typical room-setting of 100 years ago; a Recruiting Room, with an Army Sergeant to persuade visitors to “join the Colours”; Memorabilia and Artefacts kindly lent by several local residents; and a roomful of World War 1 models made and displayed by the Spalding and Fenland Model Club. A display of work by students at the Deepings Academy includes one piece that has moved several readers to tears! Refreshments today will be served in The Officer’s Mess (the Lionel Beck Room!) by Deeping St James Women’s Institute. Visitors’ comments yesterday lead us to believe this is the best World War 1 exhibition ever! This entry was posted in Family History, Our Events, West Deeping History, World War 1 on November 9, 2014 by wdheritage.